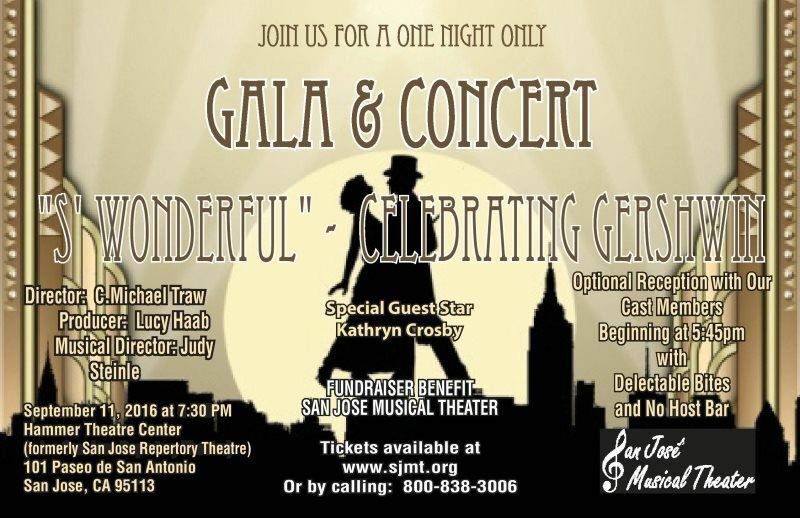 Kathryn Crosby, star of stage, screen and tv, will headline the cast of San Jose Musical Theater's "S' Wonderful" a Gershwin Concert to play one night only on Sunday, September 11. The fundraiser is being held to help bring local musical theatre back to San Jose. Ms. Crosby will join a cast of twenty doing a cavalcade of music from the Gershwin songbook. 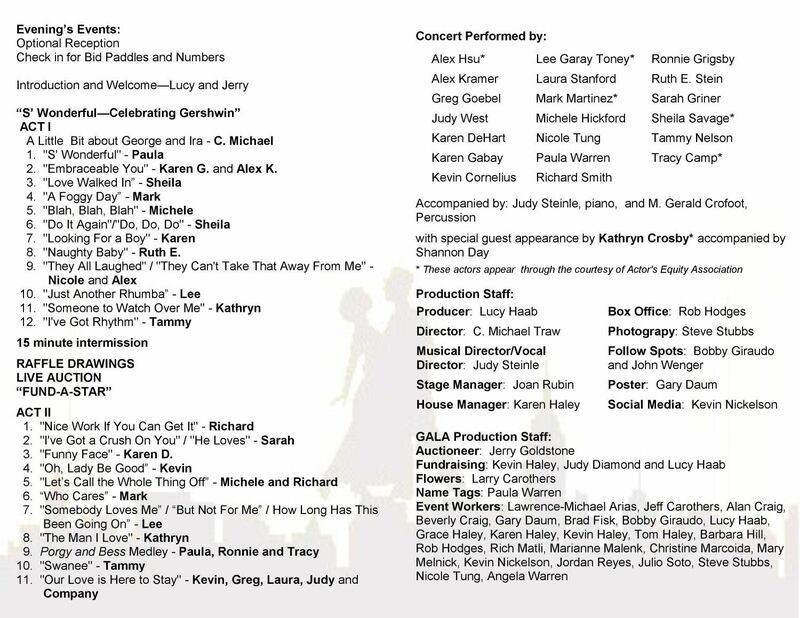 Among those appearing will be Karen Gabay and Alex Kramer formerly of Ballet San Jose, Tammy Nelson, on loan from “Beach Blanket Babylon” in San Francisco, Lee Garay Toney, veteran director and actress and many more including Tracy Camp, Kevin Cornelius, Karen DeHart, Ronnie Grigsby, Sarah Griner, Michelle Frieberg Hickford, Mark Martinez, Sheila Savage, Richard Smith, Laura Stanford, Ruth E. Stein, Paula Warren and Judy West. Singing and dancing to some “Fred and Ginger” classics will be Nicole Tung and Alex Hsu. Musical director will be Judy Steinle and the producer is Lucy Haab. Director, C. Michael Traw will host with stories about the Gershwin brothers who wrote such memorable music as "Embraceable You," "The Man I Love," "I've Got Rhythm" and of course, "Porgy and Bess." The venue will be the recently reopened Hammer Theater in San Jose at 101 Paseo de San Antonio, formerly referred to as San Jose Rep. This will be one of the first events held at this theater since San Jose State University has taken over the management. Included in the evenings festivities will be a live auction and raffles. There will be an optional reception with the cast and staff beginning at 5:45 p.m. with show time scheduled for 7:30 p.m.